Real Americans solve environmental problems instead of profiting from them. Clean Water is a basic human right, which is too often denied because of political corruption, as it is here in Florida. The summer of slime could have wide-ranging implications, from politics to business. If it continues, the summer of slime could have wide-ranging implications, from politics to business. Gov. 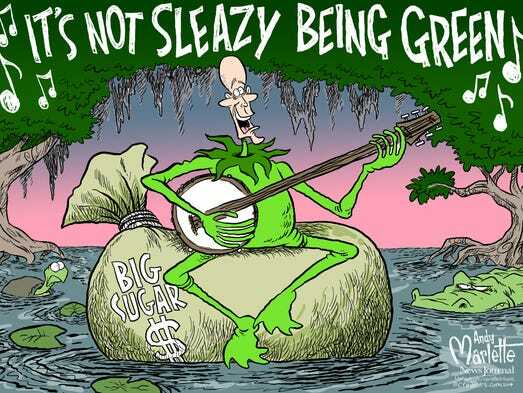 Rick Scott, who consistently cut funding to the state's environmental regulators, issued emergency orders to state water managers to try to stop the spread of a nasty green wave that looms as a potential stain for his on-going campaign for the U.S. senate. The U.S. Army Corps of Engineers also announced plans Thursday to stop releases to the east coast for nine days, to allow time for tides to flush the algae. But they warned the lake dumping would likely resume as summer rains push water levels higher. Along the coast, where months-long blooms hammered the St. Lucie in 2016, businesses and residents are bracing for the worst. "The waters were starting to clear a little bit before this happened again," said Mary Radabaugh, manager at Central Marina in Stuart where eight-inch thick algae mats paralyzed the marina two summers ago. "We were starting to have more of those turquoise waters, but absolutely no life." For environmentalists, who've argued for decades that the state needs to do more to monitor and clean its water, the bloom is just the latest evidence of the state's failure to address its polluted water. It's a problem they say will continue to be as inevitable as the steamy summers. "So the $64,000 question is why? Why?" said biologist John Cassani, director of Calusa Waterkeeper. "Those of us who've been following political decisions, the false narratives, the half truths, the broken promises to address nutrient over-enrichment, this is a manifestation of that. So to us who have been following it for decades, it's like damn. Why do we keep getting all these diversions and deceptions. It just gets worse." Scientists began to worry this spring that the lake might be in for a major bloom following Hurricane Irma, which whipped up the lake with tropical storm force winds as it moved north, mixing up a silty bottom where decades of nutrients have settled. Massive amounts of stormwater, loaded with even more nutrients, also got dumped from the north and flattened western marshes that help filter water before entering the Caloosahatchee. Then came record rain in May, shattering a century-old record. Normally, the U.S. Army Corps of Engineers, which maintains the lake's dike and controls water levels, tries to keep lake levels higher during the dry season and lower during the summer rainy season — to protect aquatic life in the lake but also to relieve pressure on its aging earthen dike. The Corps is in the midst of a $1.6 billion repair job to shore up the dike and has completed repairs on some stretches. But the heavy rain made the releases of the nutrient-laced waters to the coasts inescapable. By last week, the deepening bloom covered half the lake, and quickly began piling up on the shores of the Caloosahatchee and in finger canals. In the River Oaks neighborhood just west of LaBelle, the algae lefty a scummy line on docks and pilings, and socked in sailboats and pontoons. Residents were mostly in disbelief. "I grew up on this river. I learned to swim in this river. I learned to ski in this river. And the last couple of years, it's been bad," said Nickey Guffey, who lives in North Carolina but still owns property in Immokalee and returns monthly to fish and visit family. "You come out to go fishing, but I don't even bring the boat anymore. It's just a waste of gas." How it got this bad is rooted in the state's old flood control and its struggle to meet all needs. The lake was mostly disconnected from the coasts before development, spilling water during the rainy season over a lower bottom lip which flowed south through marshes and into the Everglades. Beginning in the late 1800s, falls and other snags were removed from the Caloosahatchee to make it more navigable. In the 1940s, the federal government launched its Central & South Florida Project to drain the region, build a water supply and flood control system and enclose the lake with a massive dike. The design essentially provided the lake with two plugs, to the St. Lucie and Caloosahatchee. Another gate to the south allows water for irrigation, but is far smaller than the east and west gates. "It's puny," said biologist Paul Gray, Audubon Florida's Lake Okeechobee Science Coordinator. "That's the way the system was designed. That's the problem the Corps has." Over the years, the lake also filled up with nutrients, mostly from farm and ranch run-off in the beginning, but now the polluted inflow includes a mix of urban stormwater and pollution from leaky septic tanks. For decades the state has wrestled with how to clean the water, installing filter marshes and ordering farmers and ranchers to comply with rules to restrict run-off. State environmental regulators set the limit for the amount of phosphorus coming into the lake, but the amount is regularly far more than the lake can handle. And with such a large bloom, not much can be done but to wait and watch. "When it coves hundreds of square miles, there's really nothing you can do," Gray said. "They eventually burn themselves out, but that depends on nutrients." 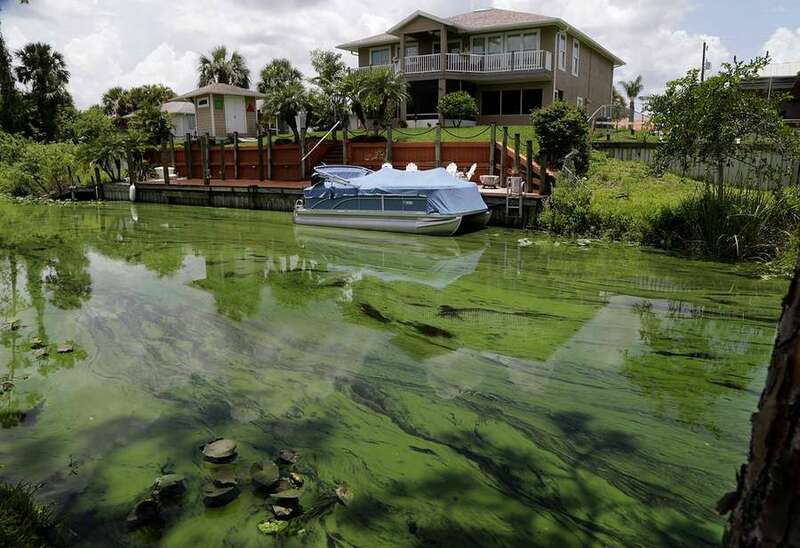 This week, Cassani took water samples from five of the hardest hit locations on the Caloosahatchee and found levels of microcystins, the toxic bacteria in blue-green algae, at between 172 parts per billion and 1,970 parts per billion, many times higher than the 4 parts per billion the Environmental Protection Agency considers safe. After several days of local news coverage, the Florida Department of Health posted signs Wednesday. Cassani said he sent the sampling results to the Florida Department of Environmental Protection, which has been posting sampling results online. Spokesman Dee Ann Miller said the agency is responding as quickly as possible to reports and is also using satellite imagery to search for blooms. But she also said weather conditions and algae characteristics can cause blooms to change, often quickly. On Friday, results from June 25, the latest posted, showed microcystins only at two locations, in Moore Haven and LaBelle, and at much lower levels. Depending on the severity and persistence, the blooms can do lasting damage to the ecosystem. Beyond the public health threats, the unsightly blooms have triggered fish kills and wiped out oysters and sea grass in past years. Frustrated residents say it's time to come up with a different strategy for the lake. While a massive reservoir to hold more water was approved last year and is on its way to congressional approval, the South Florida Water Management District expects construction to take at least seven years. "We don't understand how the Army Corps, in good conscience, can open the gates with that kind of algae," said Jacqui Thurlow-Lippisch, the former mayor of Sewall's Point who blogs frequently about estuary conditions. "We had been having algae come in and out as they were opening the gates, but now we're afraid we're going to get the mother lode." For the time being, the district says it's hoping temporary pumps and emergency operations will help hold releases down and save the coasts from being slimed. "We're using most all of the canals we have in Palm Beach, Broward and Miami-Dade that have coastal links. We're trying to get the water out," said district spokesman Randy Smith. But weather will still be the deciding factor. And while the forecast calls for less rain over the next two weeks, the overall rainy season forecast is expected to be wetter than normal. "I feel sorry for people who come to Florida who don't expect to see anything but what they see on TV," said Caren Tadlock, who regularly comes from Texas to see her daughter, a plant breeder for Monsanto in Ortuna. This week she made a trip to LaBelle to see the blooms for herself after a neighbor had told her she regularly swims in the river, unafraid of gators. But the algae? "She said I'm not getting in it. She thinks this is toxic."